Made in multiple of 8 stitches and 16 row repeat. I started row 11 with 5 purls, then 4 knits. I followed with repeated patterns of 4 purl, 4 knit. After just about 20 stitches, I knew something was wrong. I rechecked your pattern and comments. Since the instructions and comments verified that I was copying your pattern, I kept with it. I completed row 12. By knitting as they appear. With these two rows (11 and 12), my blanket with tilt stripes has completed shifted from areas of knits to purls and vice versa. I can’t figure out how to “knit as they appear”. Is there somewhere that teaches more about this? What does “knit stitches as they appear” mean? knit as stitches appear means: If you knit the stitch in a row, you should purl it in the next row. 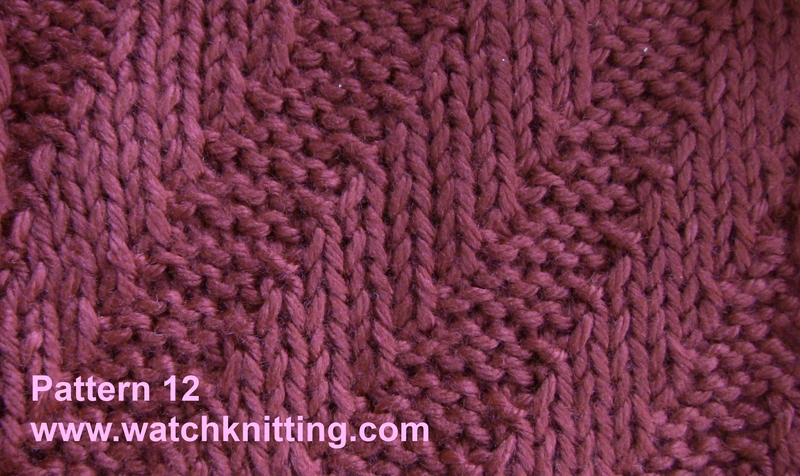 Let say you are knitting a single Rib stitch (1 knit, 1 purl), assuming that you have started with a knit stitch. then: The 1st,3rd,5th,7th, … will be knit stitch, while the 2nd,4th,6th,8th, … in the first row will be purled. Knit as they appear means: if you have 10 stitches (an even quantity), considering above assumption, start the second row with the knit stitch. if you have 9 stitches (an odd quantity), start the second row with the purl stitch.